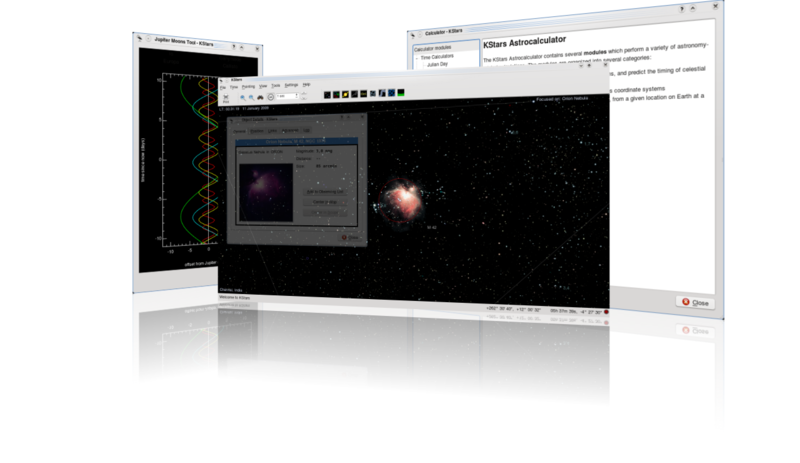 KStars is free, open source, cross-platform Astronomy Software. It provides an accurate graphical simulation of the night sky, from any location on Earth, at any date and time. The display includes up to 100 million stars, 13,000 deep-sky objects,all 8 planets, the Sun and Moon, and thousands of comets, asteroids, supernovae, and satellites. For students and teachers, it supports adjustable simulation speeds in order to view phenomena that happen over long timescales, the KStars Astrocalculator to predict conjunctions, and many common astronomical calculations. For the amateur astronomer, it provides an observation planner, a sky calendar tool, and an FOV editor to calculate field of view of equipment and display them. Find out interesting objects in the "What's up Tonight" tool, plot altitude vs. time graphs for any object, print high-quality sky charts, and gain access to lots of information and resources to help you explore the universe! Included with KStars is Ekos astrophotography suite, a complete astrophotography solution that can control all INDI devices including numerous telescopes, CCDs, DSLRs, focusers, filters, and a lot more. Ekos supports highly accurate tracking using online and offline astrometry solver, autofocus and autoguiding capabilities, and capture of single or multiple images using the powerful built in sequence manager. Have a look at the Feature listing for more. Get KStars Lite for Android on Google Play Store. KStars Lite supports many features of the desktop version optimized for tablet/phone use. It supports telescope and camera control, color schemes, and different projection systems. Just point it any where in the night sky and identify what objects and constellations you are looking at, plus a lot more! KStars 3.2.1 is released on April. 25th, 2019 and can be installed on Microsoft Windows, Mac OS, and GNU/Linux. Windows Download: KStars 3.2.1 Installer for Windows 7, 8, & 10. MacOS Download: KStars 3.2.1 DMG Installer is available for MacOS 10.12+. After mounting the DMG, please follow the instructions within the DMG. Source Tarball: KStars 3.2.1 Source tarball mirror list is availabe to build from source. For other platforms, see our Installation Page for instructions. 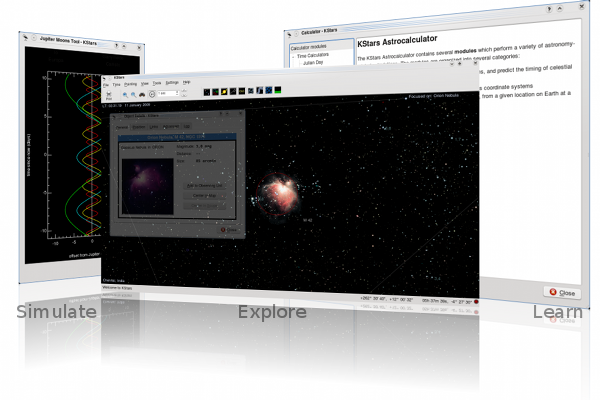 KStars is probably the most feature-rich free astronomy software. KStars caters to a wide-variety of use cases. Whether you are a student, an educator, an amateur astronomer or an astronomy enthusiast, you will find tools in KStars that are useful to you. Click here to see a full listing of features, organized by use case. Graphical simulation of the sky with the planets, up to 100 million stars, 10000 deep-sky objects, comets and asteroids. Adjustable simulation rate. A host of tools that predict conjunctions, plot time variation of positions of planets, perform calculations etc. Powerful observation planner to plan your observations. GSoC Guide - Google Summer of Code guide for new prospective students. For our full credits list, see our contributors' page. To report a bug against KStars, you can use the KDE bug reporting interface. Choose "kstars" as the product to file the bug against. KStars has a lot of known issues, and many unknown issues. In either case, reporting a bug is always helpful. If you find problems with KStars, you are also most welcome to tell us on our mailing list or on our Web Chat channel where you can chat directly with developers and users. For some of these issues, there are temporary workarounds, and asking on the mailing list will help you discover these antidotes for smyptomatic relief. We welcome your feedback, and discussion on both the mailing list and IRC channel. See the Join Us section for more information and pointers. Interested in KStars? Found KStars useful? Come by our mailing list and share your suggestions, and tell us what you liked / what you did not like. Any feedback and help will be appreciated. If you know how to program, you're welcome to join our developer team! See this page to build KStars from source. Most developer discussion happens on our mailing list, so if you need help, that's a good place to ask. KStars is written in C++ using Qt and KDE libraries. If you are an astronomy enthusiast, there is our AstroInfo project. We could also use help writing documentation and translating. Even bug reports and feature requests are a big help, so keep them coming! Hang out on our IRC channel: #kde-kstars on the freenode network. Click here to join the channel. Some junior and not-so-junior jobs here! Stellarium: Stellarium has the most aesthetic rendering of the sky map. Ideal for giving public shows. Has a larger star catalog than KStars. It can distort images for projection on fish-eye planetarium projectors. SkyChart (Cartes du Ciel): Cartes du Ciel has the largest database of astronomical objects for any free software. It has support for the very very extensive star catalog, PPMXL. Also has tons of other downloadable catalogs.